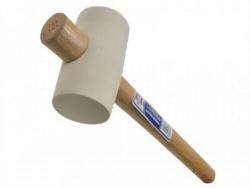 All purpose white rubber mallet, suitable for DIY tasks and applications where a steel head is unsuitable. Featuring self locking handles to deliver a gentle but firm blow with little rebound. The wooden handle is contoured to provide a comfortable grip during use.